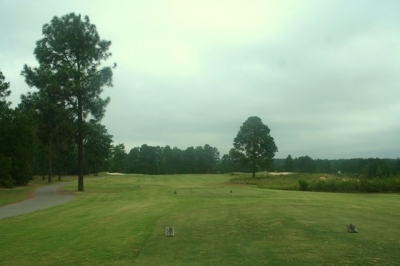 PINEHURST, NC – Golf courses acquire all sorts of reputations, some for historic value, some for conditioning (good or bad), some for great service, and some for nothing at all (meaning they’re not worth remembering). 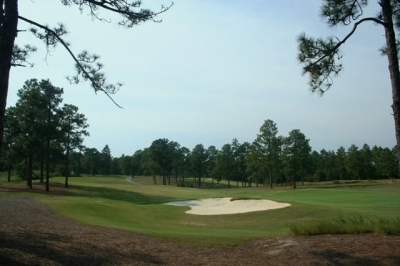 And it’s not often that an infamous reputation acts in your favor, but that’s definitely true of The Pit Golf Links in Pinehurst, North Carolina. It seems everyone who knows Pinehurst knows The Pit – it’s such a distinctive golf experience that it would be impossible not to remember it once you’ve been there. The Pit’s scorecard reads ‘A Dan Maples Original,’ and that’s certainly the truth. Maples has created something so ‘original’ that there’s scarcely anything like it this side of the ocean that separates us from the Old Country. 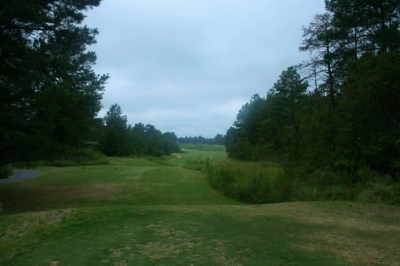 Looking from the fairway of the par four 11th hole - the length of your second shot over the water depends on how much club you took off the tee and your placement in the fairway. The initial excavation didn’t last long, apparently, as the sand on that portion of the land was only ten feet deep, with a clay layer underneath it. Deeper sand was found over by where the sixteenth hole is located today (in 1926), and the mining operation slowly made its way over to where the clubhouse is now – where the sand is 30 feet deep. 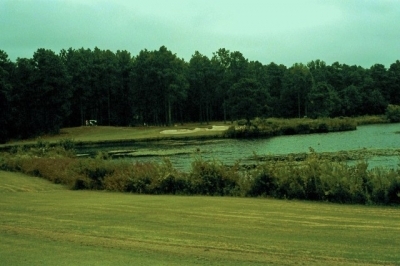 The sand mining operation ended in 1972, and the golf course opened in 1985. Looking at the green of the par three 7th hole from the deck of The Pit condos. Maples said they didn’t really do anything other than set out to build eighteen holes of golf, but in the process they built a course with a lot of different looks – everything from wide open holes, to traditional parkland-style holes to holes so tight they must’ve really had to squeeze them in – and there’s even an island green in the middle of a large lake. “But we had to drain the lake in order to put the holes around it – and where that green was sitting was on kind of a little ‘hill,’ some raised ground from the bottom. It was a good, solid, hard place to put an island – and that’s why the green’s sitting where it’s at today,” Maples added. Even the tee markers are unique at The Pit, and they hint at the land's mining past. It couldn’t have been any other way, since to haul that much dirt into the middle of a lake would be a monumental task – so that hole (the par three 12th hole) just kind of ‘evolved,’ just like the rest of the holes. “That’s the way we are – that’s the way we do every golf course,” Maples said. The methodology seems to have worked, down to the smallest detail – which included the course’s name. Maples said they went through hundreds of names and kept coming back to The Pit – they just couldn’t come up with anything else that would capture the essence of the place. And besides, it’s easy to spell, and it looks good on a hat. After enduring the bruising par four ninth hole, Dan Maples gives you a break on the short par four 10th hole. 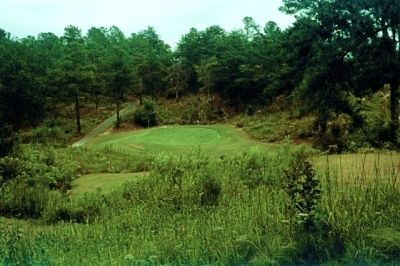 The Pit’s quirky nature also received an endorsement from another course designer known for incorporating a few twists and turns in his work, Pete Dye. 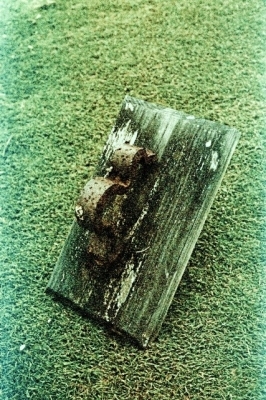 “I took Pete Dye around it in the beginning, and he loved it – and he said, ‘now you’re going to catch some of the grief that I catch.’ He said not everybody’s going to like this golf course, which isn’t something we were used to, but I realized just then that this course was just slightly against the grain,” Maples remembered. It’s the type of ‘oddity’ that you might find in Europe at some of the older courses – layouts that were ‘built’ so long ago that it just wasn’t possible to move much earth. Maples often tells people who are wanting to go to play in Ireland or Scotland to try The Pit first – and if you don’t like it, then don’t waste your money going overseas. Seeing as the course is very tight in places and a bit hard to navigate even if you know where to hit your shots, it provides more than enough challenge for almost everyone who plays it. Modern technology has caught up to The Pit in some ways, however, which has brought about the only major change in the course since it’s opening – a new set of tees known as the ‘Scratch’ tees. They’re not listed on the scorecard and you’ll have to get permission to use them – but they lengthen the course to just over 7000 yards. There are white posts to the rear of the tee boxes on all the holes, marking the location of the ‘scratch’ tees. The green of the par three 16th hole defines 'small target,' but it's only 148-yards from the back tee. “We had twenty-five golf pros play it the first day we opened the scratch course – and the low score was 78 – and they loved it, and said it was fair. That’s all we can ask for,” Maples said. “When people go on a trip, they want to play a golf course that they can’t play at home – and this is not like any course that you have around your home, no matter where you live,” DiCarlo added. Try not to focus on the water off the tee of the dogleg right par four 11th hole. DiCarlo admitted that they do get an occasional player who doesn’t care for it – but it wouldn’t be truly off-beat if everyone liked it, right? If anyone doesn’t end up liking The Pit, it may be because they played it too aggressively, which DiCarlo says is a big mistake. There are some holes where if you choose to hit driver – not only will you have to choose the correct direction to aim, you’ll also have to be pinpoint accurate, which is a shot that most players don’t have in their bags. Needless to say, The Pit can be punishing if you’re hitting it wildly – but that’s true of just about every course. DiCarlo says the best strategy to playing the layout is to take whatever club will keep you in play off the tee -- and then it’s actually very manageable, because the next shot usually isn’t going to be that long. 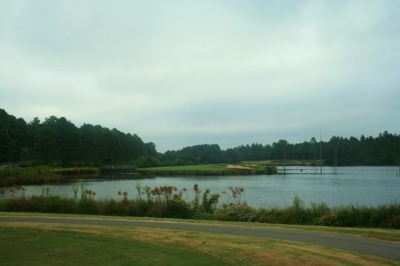 Nothing but water surrounds the green complex of the par three 12th hole - so hit the green. On a course like this, where every hole is its own experience, we particularly enjoyed the par three fourth hole, which plays 229-yards from the back tee. The yardage book recommends ‘hit it straight,’ which is salient advice -- because if you don’t, you won’t likely find your ball again. The hole is framed by large sand mounds and trees on both sides, providing a chute to hit through – and it isn’t wide, either. The 489-yard, par five eighth hole looks benign on the scorecard, but nothing at The Pit is as easy as it would seem. This is one of those holes where your tee ball will have to be in the perfect spot to go for the green in two – but if not, even the lay-up shot can be a challenge. What you’ll remember most about the hole is a large tree that guards the left side of the green and very much comes into play on your approach shot. 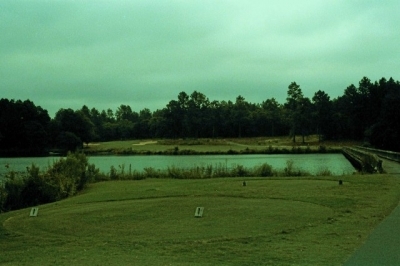 The back nine features The Pit’s version of ‘Amen Corner,’ three holes that play over and around the property’s large lake. 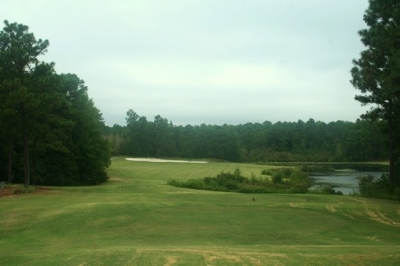 The sharp dogleg right par four eleventh hole offers an intimidating tee shot with water all down the right side – which leaves a short to mid-iron approach over the water to a green guarded by a large bunker to the front-right. The somewhat quirky par five 15th hole definitely has an Old Country feel to it. The par three twelfth is The Pit’s island green – it’s a good thing it isn’t long (175-yards from the back tee), and the island is fairly large. It probably won’t remind you of TPC Sawgrass with its size – which is a good thing. The par four thirteenth hole presents you with an intimidating water carry for the tee shot, though the yardage book indicates it looks farther than it is. Even if you manage to stay dry off the tee, you’re work’s not done as you’ll have a difficult second into a green well protected by a bunker front and left. Maples says lady players love The Pit, because they’re able to hit it straight – and that’s what you need more than anything on this course. For that reason, we chose The Condos at The Pit, located just south of the Village of Pinehurst and close enough to the area’s amenities -- yet far enough ‘away’ to make it feel like a real vacation spot. 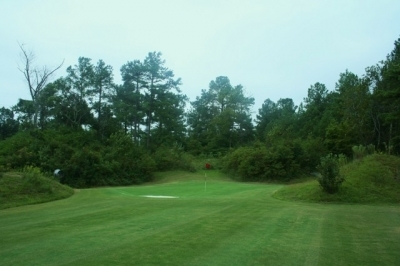 Play it down the right side off the tee of the par five 18th hole. 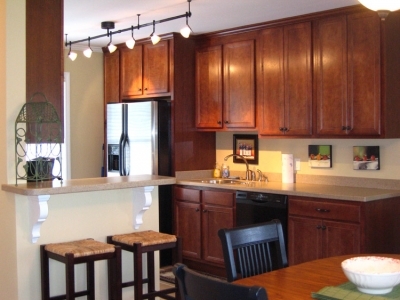 The Pit condos offer full kitchens -- a terrific convenience after a day on the links. Rates range from $29 to $120, depending on the time of day and time of year. Consult the Website for current rates and policies. Walking is allowed at The Pit.